Figure 2-6.-Radar and weapon systems on an AEGIS class cruiser. Anti-Air missiles (fig. 2-7). The radar system associated with the Mk 99 MFCS is the missile illuminator AN/SPG-62. AN/SPG-62 RADAR.-The AN/SPG-62 is I/J­Band fire control radar. The SPY-1 radar system detects and tracks targets and then points the SPG-62 toward the target, which in turn provides illumination for the terminal guidance of SM-2 missiles. Refer to chapter 1 for discussion on the different phases of missile guidance and the way radar is used for missile guidance. Remember that in order to track a target you need a very narrow beam of RF energy. The narrower the beam, the more accurately you can tell if you have one target or multiple targets (this is called radar resolution). This narrow beam radar is normally a second radar that works with a primary search or track radar. The AN/SPG-62 illuminating radar works as a second radar with the AN/SPY-1 series radar. See figure 2-6 for the location of AN/SPG-62 on an AEGIS cruiser. Figure 2-7.-SM-2 ER Anti-Air missile on launcher. Mk 86. The Mk 86 GFCS controls the fire of the Mk 45 5-inch gun. 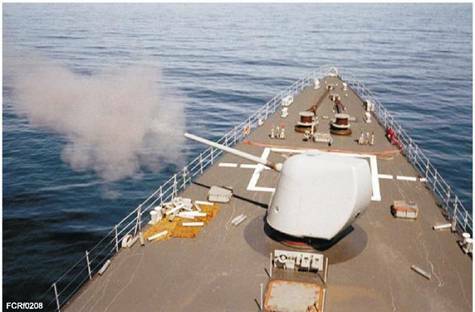 The Mk 86 Gun Fire Control System (GFCS) provides ships of destroyer size and larger with an economical, versatile, lightweight, gun and missile fire control system that is effective against surface and air targets. The Mk 86 Gun Fire Control System (GFCS) is the central sub-element of the Mk 34 Gun Weapons System (GWS) on AEGIS class ships. It controls the ship's forward and aft 5 "/54 caliber Mk 45 gun mounts (fig. 2-8) and can engage up to two targets simultaneously. The SPQ-9 series and Mk 23 TAS (Target Acquisition System) work together to provide control for Naval Gun Fire Support (NGFS), Submarine Warfare (SUW) and Anti-Air Warfare (AW) gun engagements. The Mk 86 GFCS also uses a Remote Optical Sighting system. This is a separate TV camera with a telephoto zoom lens mounted on the mast and each of the illuminating radars. The optical sighting system is known as ROS on the SPRUANCE class destroyers and is mounted on the SPG-60 illumination radar. The Mk 34 GWS on AEGIS class destroyers and cruisers uses the Mk 46 Mod 0 Optical Sight System on the SPG-62 illuminators. The Mk 86 GFCS is the controlling element, where loading and firing orders originate. After an operator selects the GFCS mode, the system calculates ballistic gun orders. These orders can be modified to correct for environmental effects on ballistics. The GFCS conducts direct firing attacks against surface radar and optically tracked targets, as well as indirect firing during Naval Gun Fire Support (NGFS). Figure 2-8.-A 5"/54 Mk 45 gun mount. See figure 2-10 for a list of weapon systems and their sensors related to the Mk 86 GFCS on a SPRUANCE class destroyer. The AN/SPQ-9 Surface Surveillance and Tracking Radar, developed by Northrop Grumman Norden Systems, Melville, NY, is a track-while-scan radar used with the Mk-86 Gunfire Control system on surface combatants. Since it is a typical fire control radar, we will discussed it in more detail to help you understand the basic function of fire control radar. The AN/SPQ-9B detects sea-skimming missiles at the horizon, even in heavy clutter, while simultaneously providing detection and tracking of surface targets and beacon responses. The AN/SPQ-9B is available as a stand-alone radar or as a replacement for the AN/SPQ-9 in the Mk 86 Gun Fire Control System, which will be integrated into the Mk 1 Ship Self Defense System (SSDS). The Radar Set AN/SPQ-9B is a high resolution, X-band narrow beam radar that provides both air and surface tracking information to standard plan position indicator (PPI) consoles. The AN/SPQ-9B scans the air and surface space near the horizon over 360 degrees in azimuth at 30 revolutions per minute (RPM). Real-time signal and data processing permit detection, acquisition, and simultaneous tracking of multiple targets. The AN/SPQ-9B provides raw and clear plot (processed) surface video, processed radar air synthetic video, gate video, beacon video synchro signals indicating antenna relative azimuth, Azimuth Reference Pulses (ARP), and Azimuth Change Pulse (ACP). The radar will maintain its capabilities in the presence of clutter from the sea, rain, land, discrete objects, birds, chaff, and jamming. The AN/SPQ-9B has three modes of operation: air, surface, and beacon. The air and surface modes have a submode for Combat Systems training. The AN/SPQ-9B complements high-altitude surveillance radar in detecting missiles approaching just above the sea surface. The system emits a one-degree beam that, at a range of approximately 10 nautical miles, can detect missiles at altitudes up to 500 feet. Since the beamwidth expands over distance, the maximum altitude will increase at greater ranges. The air mode uses the Pulse-Doppler radar for detecting air targets. When the AN/SPQ-9B radar detects an air target and initiates a track, it will determine the target's position, speed, and heading. 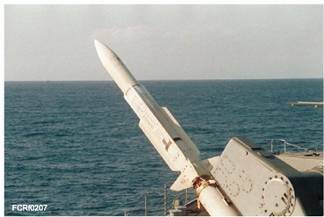 The air mode has a sector function called the Anti-Ship Missile Defense (ASMD). When the radar is radiating, the air mode is enabled continuously. The surface mode generates a separate surface frequency and an independent pulse with a pulse repetition interval (PRI) associated with a range of 40,000 yds. In the surface mode, the AN/SPQ-9B radar has 360-degree scan coverage for surface targets. The radar displays raw and clear plot video, has a submode called Surface-Moving Target Indicator (MTI), and operates concurrently with the air mode. While the radar is in the radiate state, the surface mode is enabled continuously. The beacon mode generates a separate beacon frequency and an independent pulse with a PRI having a range of 40,000 yds. The AN/SPQ-9B radar has 360-degree scan coverage for beacon targets. The received beacon video is sent to the console for display and distribution, while beacon track data is sent to the computer for processing. The AN/SPQ-9B beacon mode operates at the same time as the air and surface modes. The ASMD Sector function allows the air mode to provide quick response detection of low-flying high-threat targets. Through this function, the radar automatically detects, tracks, and reports any targets entering the ASMD sector that require a reaction time of less than 30 seconds. The operator can select an ASMD azimuth sector width between five and 360 degrees and a range of up to 20 NMI. The ASMD sector function operates together with the air, surface, and beacon modes. The Surface-MTI Submode allows the surface mode to cancel non-moving targets. The Surface-MTI azimuth sector width is operator selectable between a bearing width of five and 360 degrees, with the AN/SPQ-9B automatically displaying any targets with a relative speed exceeding 10 knots. The AN/SPQ-9B Radar Surface-MTI submode will operate concurrently with the air, surface, and beacon modes. The AN/SPQ-9 series radar also works with the SPY -1 series radar. SPQ-9 radar helps to control a number of weapons which include: SM-1/SM-2 missiles and the Mk 45 5"/54 gun.